One of our first random Custom Order Requests was for a large Magnet Board. A new client walked into our shop, took a look around and we started chatting. She asked if we would build her something custom. I said, "Sure!" because why not, right? The client just remodeled her beautiful kitchen and like most stainless fridges, it wasn't magnetic. She had school aged kids with tons of papers, schedules, to-do lists, etc that needed a home. Instead of a bulletin board or chalkboard she thought of hanging a magnet board. Only she couldn't seem to find one. 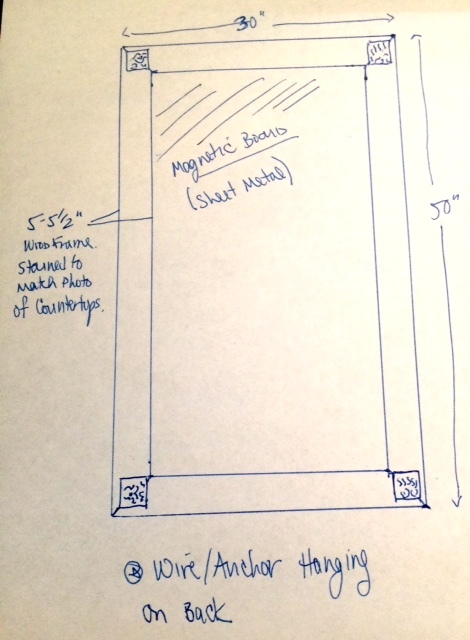 I drew a quick sketch of the details we discussed, showed Chris to confirm a price quote and made a few stain options for the client to take home to confirm. Once the details get hashed out we normally take a 50% deposit for materials and also for security so the client doesn't back out, which is pretty standard. Think about it. People always say they will go to something, and then day of they cancel and guess who is stuck paying for a 25 person party bus for her sister's bachelorette? It's ok. Its just in our nature to want to say yes right away instead of knowing ourselves and how we would rather be on our couch drinking wine and looking at the photos of the night on FB. Anyway... In this case the price was cheap enough and we hadn't put the deposit rule in place so I said check was fine once completed. We had her super fancy tiles so I figured she meant business. 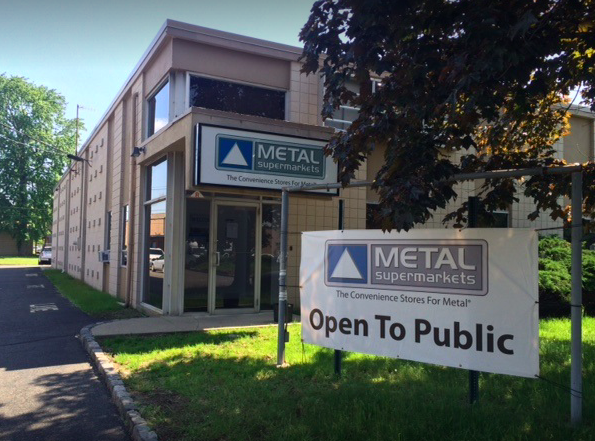 sheet metal to be cut slightly less than 30"x 50"
Metal Supermarket! My home away from home! I say "my" because Chris had never actually been there until I was 8 months pregnant and I said, "I am not planning on coming here and carrying out 20 ft of tubing with a 2 month old so you need to meet the guys so you can handle our future orders." The Metal Supermarket in Fairfield IS THE BEST. I love them. Like would invite them to Thanksgiving... or at least for a beer. So I stopped there to get a sheet cut for the project and pick up a few other things Chris needed. It is definitely not a "supermarket" like you are picturing with florescent lights but more of a metal supply shop with an office in the front, warehouse in the back stocked with all kinds of metal tubing and angle and what not in different sizes and and shapes. The guys help you select what you need, price it out, cut it down and then load it into your car out back. Its the easiest most comfortable way for some random girl to buy metal and not feel out of place. Chris started the project and ran into the whole, "Oh I didn't think this whole router situation through for the tile inlay." But like most things, the internet helped... And epoxy. Lots of epoxy. I am considering buying stock in West Systems Epoxy. There were definitely things that we learned along the way, which is what happens every time you try something new. (I usually have to remind Chris this over and over). The client was happy. We were psyched to make our first real custom project that was client designed. And we quickly realized that our Pop Up Shop was more of a "showroom" where clients could get an idea of what we do, then come to us with what they needed.